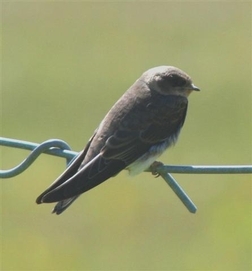 Sand Martin is a member of the hirundine family that includes Swallow and House Martin. It is the smallest European hirundine with dark brown upper parts and dark under wings contrasting with otherwise pale under parts divided by a distinctive dark chest bar. Agile fliers, feeding on flying insects mainly over or close to water, it is normally the first hirundine to return in the spring and is one of our earliest migrants. The first birds arrive in Scotland in mid to late March, exceptionally in early March. The earliest recent Arran record was 18 March in 2009, while in 2012 the first bird was reported on 25 March. 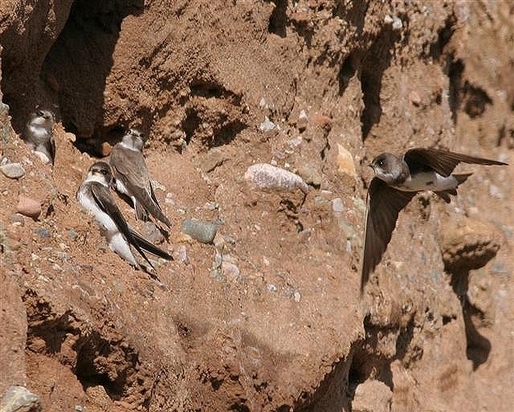 The European Sand Martin winters south of the Sahara in the Sahel region and over the past fifty years the European population has crashed on two occasions as a result of drought in the birds' African wintering grounds. They are gregarious both in the winter and in the breeding season. Their arrival here is very dependent on the weather during their lengthy journey north. Unlike the Swallow and House Martin, the Sand Martin does not build a nest. Instead, it excavates holes in sand banks, creating small, busy colonies. On Arran, the larger colonies are associated with our sand and gravel quarries but there are a number of smaller widespread colonies in a range of natural sand banks spread throughout the island by the side of burns, coastal cliffs and on golf courses. The Sand Martin is sociable in its nesting habits; from a dozen to many hundred pairs will nest close together, according to available space. The nests are at the end of tunnels which are from a few inches to three or four feet in length, bored in sand or gravel. New burrows are dug each year but birds arriving early can renovate old ones. The actual nest is a litter of straw and feathers in a chamber at the end of the burrow. It soon becomes a hotbed of parasites. Both parents help with the construction of the nest and take turns incubating the eggs and feeding the young. Usually four or five white eggs are laid about mid to late May. Incubation lasts about a fortnight with fledging around three weeks later. If the weather conditions are good, with plenty of flying insects to be caught, a second brood is attempted. After the very wet summer of 2012, raising young was even more of a challenge than normal and there were few reports of young Sand Martin. Let’s hope that the weather in 2013 proves to be more conducive for the Sand Martin and for the humans. After breeding, Sand Martin depart Arran earlier than Swallow and House Martin and by September most have set out on their long journey south. Finally remember that under the Nature Conservation (Scotland) Act 2004 it is a criminalto intentionally or recklessly damage or destroy the nest of any wild bird while it is being built or used. If you notice any disturbance to nesting birds please report it to the local police as soon as possible.